This article is about the Chinese concept of supreme god. 上帝. For the unrelated Beijing subway station, see Shangdi Station. For cognate concepts, see Tian and the Jade Emperor. 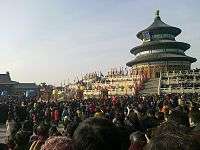 Annual heavenly sacrifice (祭天 jìtiān) in honour of the Highest Deity the Heavenly Ruler (皇天上帝 Huángtiān Shàngdì) is held at the Temple of Heaven in Beijing. State pomp and a variety of Confucian religious groups have contributed in the reviving of worship of the Highest Deity in the 2000s. Shangdi (Chinese: 上帝; pinyin: Shàngdì; Wade–Giles: Shang Ti), also written simply as Di (Chinese: 帝; pinyin: Dì; Wade–Giles: Ti; "Deity", "Emperor"), is the Chinese term for "Supreme Deity" or "Highest Deity" in the theology of the classical texts, especially deriving from Shang theology and finding an equivalent in the later Tian ("Heaven" or "Great Whole") of Zhou theology. Although in Chinese religion the usage of "Tian" to refer to the absolute God of the universe is predominant, "Shangdi" continues to be used in a variety of traditions, including certain philosophical schools, certain strains of Confucianism, some Chinese salvationist religions (notably Yiguandao) and Chinese Protestant Christianity. In addition, it is common to use such term among contemporary and secular Chinese, Hong Kong, and Taiwanese societies typically for a singular universal deity and a non-religion translation for the God in Christianity. Shang oracular script graphs for 帝 Dì, the supreme God as the celestial pole. "Shangdi" is the pinyin romanization of two Chinese characters. The first – 上, Shàng – means "high", "highest", "first", "primordial"; the second – 帝, Dì – is typically considered as a short hand for huangdi （皇帝）in modern Chinese, the title of the emperors of China first employed by Qin Shi Huang, and is usually translated as "emperor". The word itself is derived from Three "Huang" and Five "Di", including Yellow Emperor (Huangdi 黃帝), the mythological originator of the Chinese civilization and the ancestor of the Chinese race. However, 帝 refers to the High God of Shang, thus means "deity" (manifested god) , similar to "pharaoh" in concept. Thus, the name Shangdi should be translated as "Highest Deity", but also have the implied meaning of "Primordial Deity" or "First Deity" in Classical Chinese. The deity preceded the title and the emperors of China were named after him in their role as Tianzi, the sons of Heaven. Oracle bone script, the earliest known form of Chinese. The earliest references to Shangdi are found in oracle bone inscriptions of the Shang Dynasty in the 2nd millennium BC, although the later work Classic of History claims yearly sacrifices were made to him by Emperor Shun, even before the Xia Dynasty. Shangdi was regarded as the ultimate spiritual power by the ruling elite of the Huaxia during the Shang dynasty: he was believed to control victory in battle, success or failure of harvests, weather conditions such as the floods of the Yellow River, and the fate of the kingdom. Shangdi seems to have ruled a hierarchy of other gods controlling nature, as well as the spirits of the deceased. These ideas were later mirrored or carried on by the Taoist Jade Emperor and his celestial bureaucracy. Shangdi was probably more transcendental than immanent, only working through lesser gods. Shangdi was considered too distant to be worshiped directly by ordinary mortals. Instead, the Shang kings proclaimed that Shangdi had made himself accessible through the souls of their royal ancestors, both in the legendary past and in recent generations as the departed Shang kings joined him in the afterlife. The emperors could thus successfully entreat Shangdi directly. Many of the oracle bone inscriptions record these petitions, usually praying for rain but also seeking approval from Shangdi for state action. In the later Shang and Zhou dynasties, Shangdi was conflated with Heaven (天, Tiān). The Duke of Zhou justified his clan's usurpation through the concept of the Mandate of Heaven, which proposed that the protection of Shangdi was not connected to their clan membership but by their just governance. Shangdi was not just a tribal but instead an unambiguously good moral force, exercising its power according to exacting standards. It could thus be lost and even "inherited" by a new dynasty, provided they upheld the proper rituals. The Four Books mention Shangdi as well but, as it is a later compilation, the references are much more sparse and abstract. Shangdi appears most commonly in earlier works: this pattern may reflect increasing rationalization of Shangdi over time, the shift from a known and arbitrary tribal god to a more abstract and philosophical concept, or his conflation and absorption by other deities. By the time of the Han dynasty, the influential Confucian scholar Zheng Xuan glossed: "Shangdi is another name for Heaven". Dong Zhongshu said: "Heaven is the ultimate authority, the king of gods who should be admired by the king". In later eras, he was commonly known by the name "Heavenly Ruling Highest Deity" (皇天上帝, Huángtiān Shàngdì) and, in this usage, he is especially conflated with the Taoist Jade Emperor. In Shang sources, Di is already described as the supreme ordainer of the events which occur in nature, such as wind, lightning and thunder, and in human affairs and politics. All the gods of nature are conceived as his envoys or manifestations. Shang sources also attest his cosmological Five Ministries. Di, or Tian, as later texts explain, did not receive cult for being too remote for living humans to sacrifice to directly. Instead, an intermediary such as an ancestor was necessary to convey to Di the offerings of the living. According to some prominent scholars, including Guo Moruo, Shangdi was originally identical to Ku (or Kui) or Diku ("Divus Ku"), the progenitor (first ancestor) of the Zi (子) lineage, the founders of the Shang dynasty, attested in the Shiji and other texts. According to this interpretation, this identification had profound political implications, because it meant that the earthly Shang kings were themselves by birth aspects of divinity. Further evidence from Shang sources suggests that there wasn't a complete identification between the two, as Di controls spirits of nature, while Kui does not; Di is frequently pictured sending down "approvals", while Kui is never so pictured; and Kui received cult, while Di did not. Moreover, Kui is frequently appealed in "horizontal" relationship with other powers, undermining any portrait of him as the apex of the pantheon. David Pankenier has studied the astral connections of Shangdi, drawing on a view that interest in the sky was a focal character of the religious practices of the Shang, but also of the earlier Xia and Erlitou cultures. Especially intriguing is the fact that palatial and ceremonial structures of these cultures were carefully aligned to the celestial pole and the procession of pole stars. Pankenier notes that the true celestial pole lies in a sky template which is vacant of significant stars, and that the various pole stars are those nearest to this vacant apex which is of crucial importance. He illustrates how the Shang oracular script for Di can be projected on the north pole template of the ancient sky in such a way that its extremity points correspond with the visible star, while the intersection of the linear axes at the centre will map to the vacant celestial pole. Pankenier argues that the supreme Di was identified with the celestial pole, an idea familiar in later stages of Chinese religion, linking with the Tàiyī 太一 ("Great One") fully documented as early as the 4th century BCE. The interpretation of Shangdi as the celestial pole, Taiyi and as Ku the progenitor of the Shang is not contradictory. Feng Shi argues that Ku and Di are indeed identical. The Shang probably deliberately identified their ancestor with a universal god recognized in different regions and local cultures in order to legitimize their power. Contemporary Confucian theologians have emphasised differences between the Confucian idea of Shangdi, conceived as both transcendent and immanent, and act only as a governor of the world, and the Christian idea of God, which they conceived contrary to those of Christian as a deity that is completely otherwordly (transcendent) and is merely a creator of the world. As mentioned above, sacrifices offered to Shangdi by the king are claimed by traditional Chinese histories to predate the Xia dynasty. The surviving archaeological record shows that by the Shang, the shoulder blades of sacrificed oxen were used to send questions or communication through fire and smoke to the divine realm, a practice known as scapulimancy. The heat would cause the bones to crack and royal diviners would interpret the marks as Shangdi's response to the king. Inscriptions used for divination were buried into special orderly pits, while those that were for practice or records were buried in common middens after use. Under Shangdi or his later names, the deity received sacrifices from the ruler of China in every Chinese dynasty annually at a great Temple of Heaven in the imperial capital. Following the principles of Chinese geomancy, this would always be located in the southern quarter of the city. [lower-alpha 1] During the ritual, a completely healthy bull would be slaughtered and presented as an animal sacrifice to Shangdi. [lower-alpha 2] The Book of Rites states the sacrifice should occur on the "longest day" on a round-mound altar. The altar would have three tiers: the highest for Shangdi and the Son of Heaven; the second-highest for the sun and moon; and the lowest for the natural gods such as the stars, clouds, rain, wind, and thunder. It is important to note that Shangdi is never represented with either images or idols. Instead, in the center building of the Temple of Heaven, in a structure called the "Imperial Vault of Heaven", a "spirit tablet" (神位, shénwèi) inscribed with the name of Shangdi is stored on the throne, Huangtian Shangdi (皇天上帝). During an annual sacrifice, the emperor would carry these tablets to the north part of the Temple of Heaven, a place called the "Prayer Hall For Good Harvests", and place them on that throne. It was during Ming and Qing dynasty, when Christianity was introduced by Jesuit Priest Matteo Ricci, that the idea of "Shangdi" started to be applied to the Christian conception of God. While initially he utilized the term Tianzhu, Ricci gradually changed the translation into "Shangdi" instead. His usage of Shangdi was contested by Confucians, as they believed that the concept of Tian and "Shangdi" is different from that of Christian's God: Zhōng Shǐ-shēng, through his books, stated that Shangdi only governs, while Christian's God is a creator, and thus differ. Ricci's translation also invited the displeasure of Dominicans and that of the Roman Curia; On March 19, 1715, Pope Clement XI released the Edict Ex Illa Die, stating that Catholics must use "Tianzhu" instead of "Shangdi" for Christianity's God. When Protestantism entered China in the mid of 19th century, the Protestant missionaries also encountered a similar issue; some preferred the term "Shangdi", while some preferred the term Shen (god). A conference held in 1877 in Shanghai, discussing the translation issue, also believed that "Shangdi" of Confucianism and the Christian concept of God are different in nature. However, by the 20th century, most British missionaries, some Catholics, Chinese Orthodox Christians, and Evangelicals preferred Shangdi as a connection with Chinese native monotheism with some further the argument by linking it with the unknown god as described in bible passage of Acts 17:23-31. Catholics preferred to avoid it, due to compromises with the local authority in order to do their missions, as well as fear such translation may associate the Christian God to Chinese polytheism. Nowadays, through the secular Chinese-language media, the Chinese word of "Shangdi" and "Tian" are frequently used to as a translation for the singular universal deity with minimal religious attachment to the Christian idea of God, while Confucians and intellectuals in contemporary China and Taiwan attempt to realign the term to its original meaning. The Catholics officially use the term Tianzhu (Chinese: 天主, Tiānzhǔ), lit. "The Lord of Heaven", while Evangelicals typically utilize Shangdi (上帝). Look up 上帝 in Wiktionary, the free dictionary. ↑ For instance, the Classic of History records the Duke of Zhou building an altar in the southern part of Luo. ↑ Although the Duke of Zhou is presented as sacrificing two. ↑ Eno (2008), p. 70. 1 2 Huang (2007), p. 457. 1 2 Eno (2008), p. 74. ↑ Jeaneane D. Fowler, Merv Fowler, 2008, Chinese religions: beliefs and practices, Sussex Academic Press. ↑ "Shangdi", Encyclopædia Britannica, 2011 . ↑ "Chinese Philosophy". China Renmin Univ., 2006. ↑ The Book of Documents says: "August Heaven has no partisan affections: it supports only the virtuous". ↑ The Zuo Zhuan says: "Unless one is virtuous, the people will not be in harmony and the spirits will not partake of one's offerings. What the spirits are attracted to is one's virtue". ↑ Dong Zhongshu. Chunqiu Fanlu. ↑ Eno (2008), p. 71. 1 2 Eno (2008), p. 72. 1 2 Eno (2008), p. 73. ↑ Eno (2008), pp. 73-74. ↑ Eno (2008), p. 75. ↑ Zhōng Shǐ-shēng, 天学初征: "天是「統御世間、主善罰惡之天，即《詩》、《易》、《中庸》所稱上帝是也」，但這個主宰之天只是「治世，而非生世，譬如帝王，但治民而非生民也」"
↑ Xu Yahui. Caltonhill, Mark & al., trans. 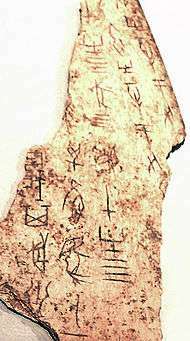 Ancient Chinese Writing: Oracle Bone Inscriptions from the Ruins of Yin. Academia Sinica. National Palace Museum (Taipei), 2002. Govt. Publ. No. 1009100250. ↑ Legge, James, The Religions of China, Hodder and Stoughton, 1880, p24-25: "'He sacrificed specifically, but with the ordinary forms, to ShangTi' -that is, we have seen, to God." Chang, Ruth H. (2000). "Understanding Di and Tian: Deity and Heaven from Shang to Tang Dynasties" (PDF). Sino-Platonic Papers. Victor H. Mair (108). ISSN 2157-9679. Huang, Yong (2007). "Confucian Theology: Three Models". Religion Compass. Blackwell. 1 (4): 455–478. doi:10.1111/j.1749-8171.2007.00032.x. ISSN 2157-9679.